Gear S2: How to quickly and easily access the messages? There are different notifications that can provide quick and easy to access to the messages saved in the Gear S2. 1. Receive silent alert and raise your wrist. 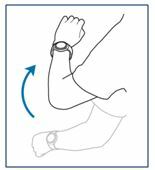 *Gesture: Set the Gear to turn on the screen when you raise your wrist that is wearing the Gear. There are 4 response options that provides flexibility in communications.